A selection of Volk’s related photographs from private collections. If you have any pictures you think might be suitable for our scrapbook then please CLICK HERE to email them as jpegs to the web editor. A picture by Ray Soper taken in 1964 with Cars 3 & 4 during their first year as a double act. The roof board on Car 3 carries the message that the railway was 81 years old – a simple modification to the 80th anniversary headboard it carried the previous year! 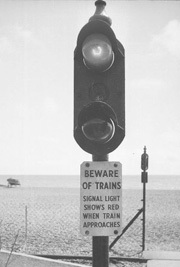 The dark shape at the top of the picture is the silhouette of the roof of the west bound car – complete with rotary controller – which is waiting to depart once the double has cleared the exit to the west loop. 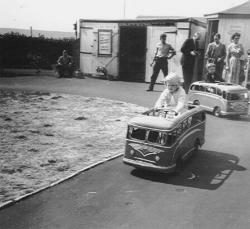 Coronation year 1953 and two cars pass at Playground. Although Blackpool have their illuminated cars Volk’s have never been much into decorating the cars for evening running. 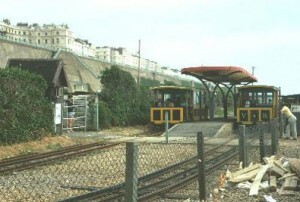 1953 was an exception as both cars and stations were dressed overall with coloured lights. 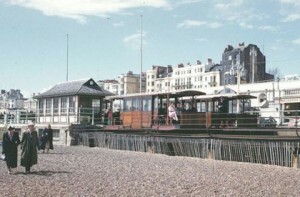 In Keith Harwood’s picture (right) an expectant school boy sits in one of the coveted front seats waiting for the driver to take Car 7 from Aquarium to Black Rock – with possibly a stop at the Playground on the way. Below, Cars 1 & 2 – now 10 & 9 – heading east approach the west loop. Photographed by Ray Soper on a sunny but not too warm day judging by the jackets and coats. Our thanks to Brian Matthews for these three pictures. 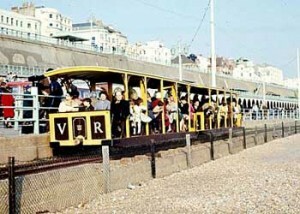 Above right is Peter Pans (Halfway in 1969) with two cars waiting either side of the freshly painted canopy. 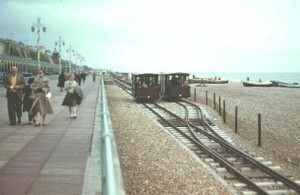 Below left are two cars at Aquarium in the late 1950’s. 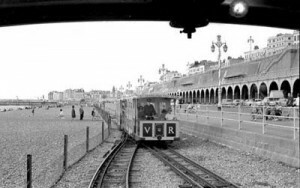 Brian emailed with the comment that in the 60’s he worked for Entertainments & Publicity at Brighton and one of his responsibilities was to look after the roll tickets for Volk’s. 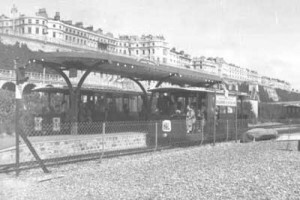 His earliest memory of the Railway was as a youngster exploring the cars stored under the Madeira Drive colonnade and pressing the foot pedal that operated the bell! Below right are two cars crossing in the West Loop sometime in the early 60s. Below a couple of shots of the world famour Johnson Midgets that ran for a time at Peter Pans. 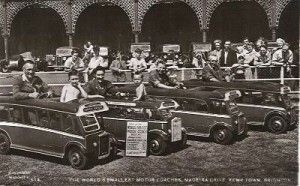 To the left a line up of some of the midget coaches, while to the right a very young lady tries her hand at driving one of the self-drive miniatures in about 1958. Only one of the latter is known to exist in original condition and that is at the small motor museum in Rolvenden. 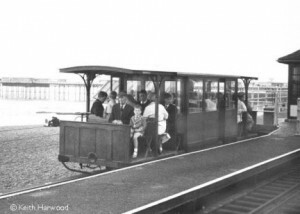 There are several of the larger coaches still in existence including two at Kerrs Miniature Railway at Arbroath.